Since the AIA in 2018, there has been an increased interest in Waterson hinges for many different projects. 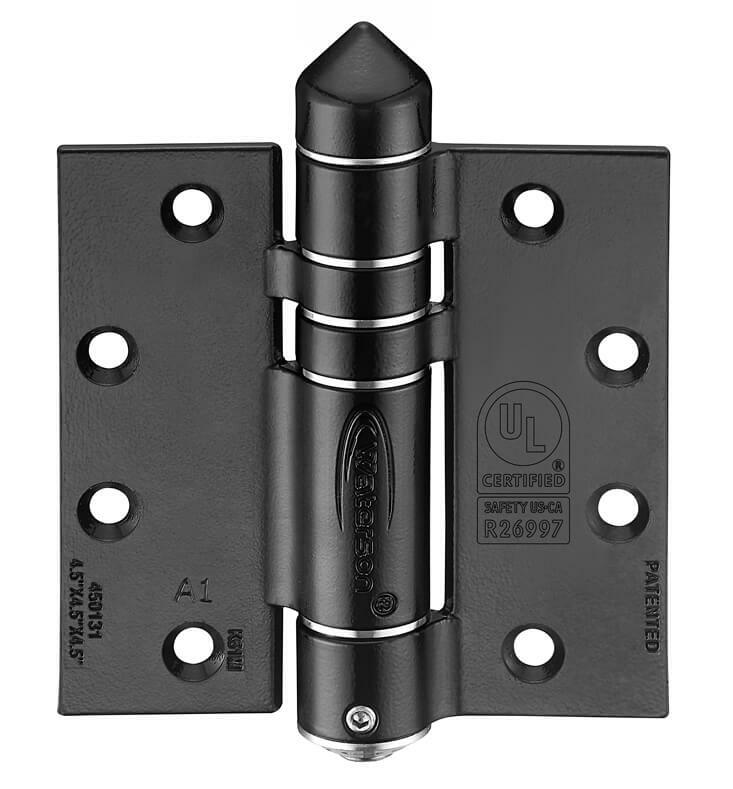 We have been inundated with inquiries by distributors in numerous states who have requested the self-closing hinge (soft closing hinge) and who are keen to be a part of our team of distributors. Are you interested in becoming one of our distributors of our soft closing hinges? Below you will find our most frequently asked questions which covers everything you need – and want – to know. If you can’t find the answer to your questions below, please don’t hesitate to get in contact with us and we will be happy to help! Question 1) What do the digits at the top of the Waterson hinges mean? These numbers are power indicator numbers. All Waterson hinges have an adjustable spring. When you turn the power adjustment to the larger numbers, the closing power will be increased. Check this link out for more information. 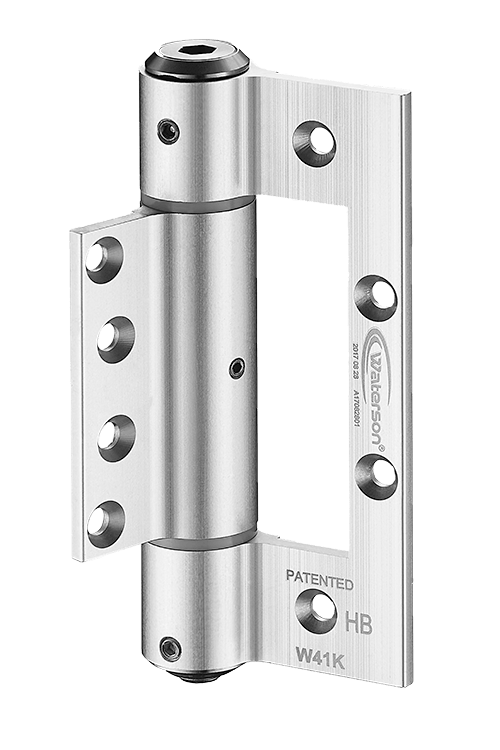 Question 2 – How do Waterson hinges control speed? 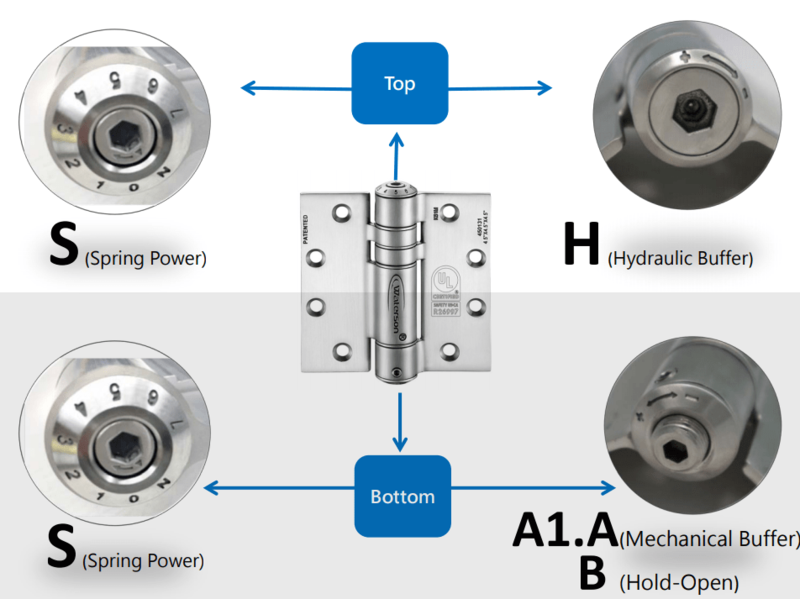 Waterson hinges can control speed thanks to the hydraulic buffer and mechanical brake they are built with. By tightening the mechanical brake, you increase the break force and this reduces speed. Whereas the hydraulic buffer works in a similar way to a stamper and is ideal for quieter zones like busy offices. Question 3) Is it possible to replace the hinges I currently have with your Waterson hinges? Would they be compatible with my particular frames? If you are looking to replace a current hinge, you will need to check the hinge barrel space required. Our hinge sizes are designed per ANSI A156.7. The barrels have a diameter of 28.5mm, which may conflict with the frame. Both the hinge hole patterns and frame need to line up in order for you to use our soft closing hinges. If you try to use a standard commercial weight, you’ll need to check the thickness because the screw holes are conformed to ANSI standards – as do all US hinges. Question 4) There are different hole patterns on our current frames/hinges compared to the ones listed on your catalogs and website. Do you have any hinges with alternative hole patterns and leaf designs? The screw hole patterns on our soft closing hinges are designed to meet the ANSI A156.7 guidelines. However, if we have enough interest in customized hinges, we will take it into consideration to make them. 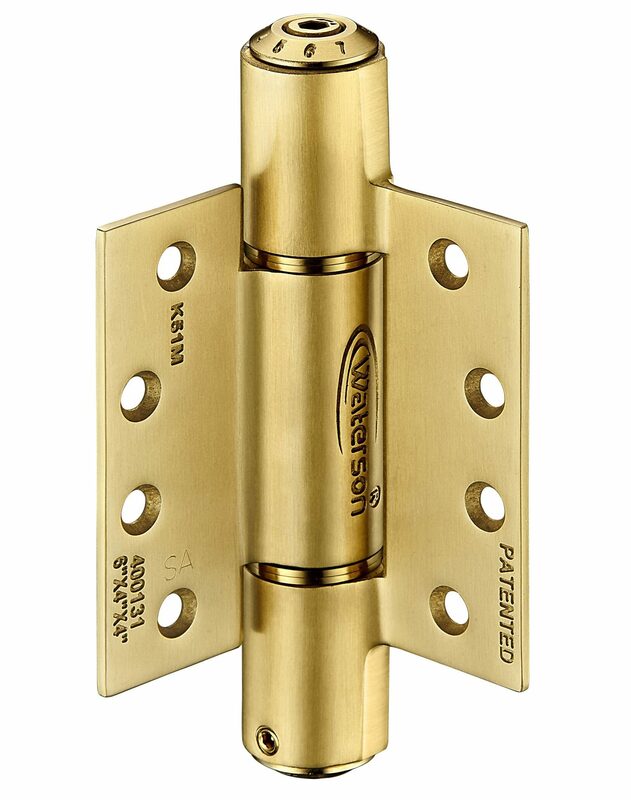 Question 5) What Waterson hinge model would you recommend for guest room doors that have a fire rating in hotel projects? We would recommend the K51M-4.5×4.5 (Hinge 3-Pack) – (Bottom, middle and top) = (SA, SA and SA1). These are the best choice for hotel guest room doors and work as a fire door closer. 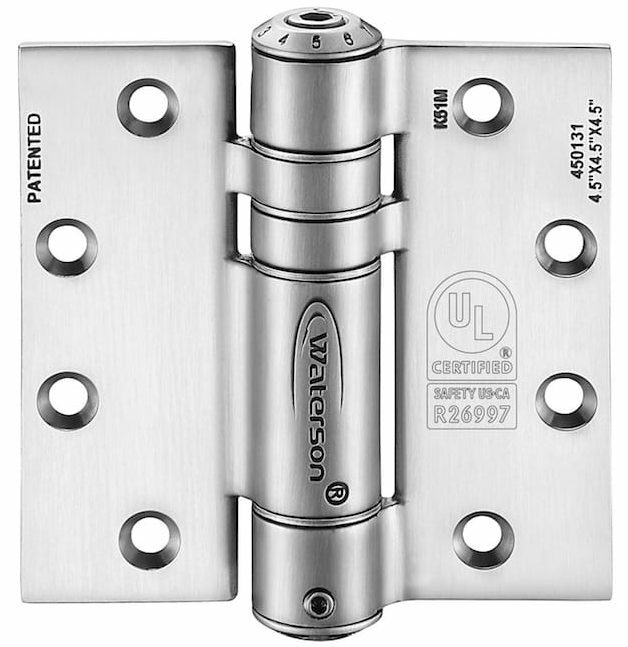 Question 6) What Waterson hinge model would you recommend for use with glass doors and fences? The hydraulic hinge is one of the most popular choices for glass doors, however it all comes down to the type of door you have. Check this link out for more information. Question 7) What Waterson hinge would you recommend for use with a fence? There are two options, the K51MP for hinges that need to be installed between doors, and the K51P for hinges mounted to posts. The (SA, SA, SA1) 3-Pack of hinges is by far the most popular option. Question 8 – What finishes can you offer? Normally we stock Black and US32D and US19 finishes only, however on request we can provide more colors like US32D and US4 to match your home’s style. The price may increase by color and quantity when specialist finishes are used. Question 9) What is your warranty policy? Indoor applications – Waterson provides a 5 Year Limited Manufacturer’s Warranty. Outdoor applications- Waterson provides a 3 Year Limited Manufacturer’s Warranty. Please email us to get our warranty policy in written format.